As we hurtle towards the end of another year and the temperature outside drops, the heat is turned up on the dancefloor with a wave of outstanding music being released. 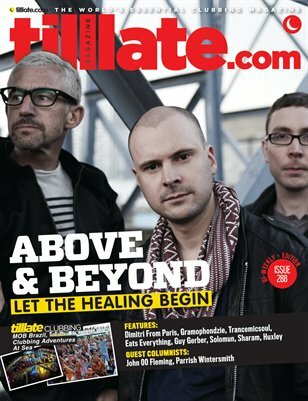 Cover stars this issue Above & Beyond have two reasons to celebrate with an artist album ‘Group Therapy’ and the latest compilation on their Anjuna Beats label, ‘Anjuna Beats Vol 9’. Tillate catches up with Jono, Paavo and Tony as all three lift the lid on their extraordinary success. Sharam takes us on a tour around his world, with his top five clubs to play, while elsewhere we catch up with Guy Gerber, Dimitri From Paris, Gramophondzie, Trancemicsoul Huxley and Joachim, to name only a few. In the first of a two part column, John 00 Fleming talks about the power of positive marketing for the modern DJ/ producer and the importance of backing it up and Parish Wintersmith brings his ‘Music and Manoeuvres’ column to Tilllate for the first time.